A massive 76% cut in government funding for Environment Agency (EA) fisheries work over the past 10 years, coupled with a ‘ludicrous’ ban on the EA’s previously successful promotion and marketing of angling and rod licence sales, is in danger of creating a vicious cycle of declining participation and reduced revenues from freshwater angling, which puts £1.4 billion into the English economy, according to the Angling Trust. A freedom of information request by the Angling Trust has revealed that over the past 10 years the government has cut its funding to the Environment Agency’s fisheries department for work in England by 76% from £5.892 million in 2007/8 to just £1.4 million in 2017/18. 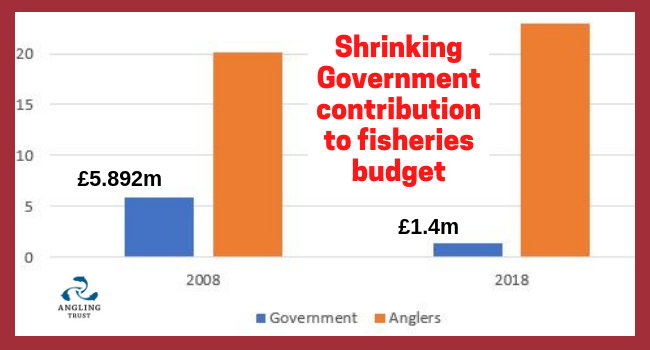 As a proportion of the total fisheries budget, the government’s share dropped from 23% in 2007/8 to less than 6% in 2017/18, with the other 94% being funded by income from rod licence sales to anglers. The fisheries work of the Environment Agency is vital to deliver its statutory duty to maintain, improve and develop fisheries, but the past decade has seen the loss of highly expert staff with specialist and local knowledge, a reduction in enforcement capacity to deal with poaching and fish theft and a lack of resources to deal with the widespread threats to fish and fishing. The government has also imposed a ban on marketing activities by all government agencies which has made it much more difficult for the EA to promote angling opportunities and ensure that people are aware of the legal requirement to have a rod licence to fish in freshwater. The Agency has to apply for an exemption from the Cabinet Office each year, which costs its small team hundreds of hours of bureaucracy. As a result, after a decade of rising rod licence sales until 2010, sales have declined over the past 8 years and about 10% in the past year. The Angling Trust warned Fisheries Minister George Eustice about the likely impact of the marketing ban on rod licence sales at an Angling Summit back in October 2014. The Trust has now written to the Minister pressing the government to restore funding to 2007/8 levels to complement the £22 million income from hundreds of thousands of anglers and to lift the ban on marketing so that angling can be better promoted.